Some approximate locations for City of Bellingham, WA reported collisions for the years 2017, 2018, and Q1 2019 (3/23/2019 to date). Not all accidents are shown. Click to enlarge charts. A first look at the Bond and Levy Results for School Districts across WA shows good results. Important bonds in Bethel, Yelm, Kennewick, Renton, Ferndale and Yakima made the 60% 'super majority'. Some of these bond results are multi-county with split school districts. For more information check the individual county results at http://results.vote.wa.gov/results/current/Turnout.html . The complicated geometry of the three school districts requesting your support this election. Note how school districts snug borders, trail rivers, and sometimes split precincts (!!) If you have any questions whether or not you should receive a ballot, check myvote.wa.gov and/or call Whatcom County Elections. Click to enlarge the map. Please Vote. Ballots were mailed 1/23/2019 for the Ferndale SD and Nooksack Valley SD bonds as well as the Concrete SD Levy. You should have your ballot by now. If not, contact Whatcom County Elections. Seven drop boxes are open for this election, but like the last two Whatcom County elections, this is a 'no stamp needed' election. Fill out your ballot early, set it on your mailbox and then check myvote.wa.gov to make sure your ballot has been received and is 'ready for tabulation'. If your vote is challenged in any way, please contact Whatcom County Elections. Please Vote. More information (under construction) below the break. (1) Many times the 60% 'supermajority' provides an insurmountable obstacle to the passage of school bonds (not school levys) in WA State.Type "Bond WA 60% supermajority" into the Google search bar to see more on this. (2) Anti-tax advocates have been dealt greater ammunition with (recent) accelerating property appraisals. This clearly leverages the anti-tax fears of older, retired populations, especially those on fixed incomes. (3) There is clearly an urban Democrat vs. rural Republican split on this. The local Republican party almost never explicitly takes an anti school bond position. But many conservative and many older voters adopt anti-tax positions anyway. (4) The supermajority bond approval rules mean that without some Republican support, school bonds will not pass in may rural school districts. (5) For any community, the a school bond issue should be an easy pass, but school infrastructure and bond interest costs are so expensive that the residents of many smaller school districts are right to be wary of increases in property taxes. More information, tables, charts and analysis below the break. 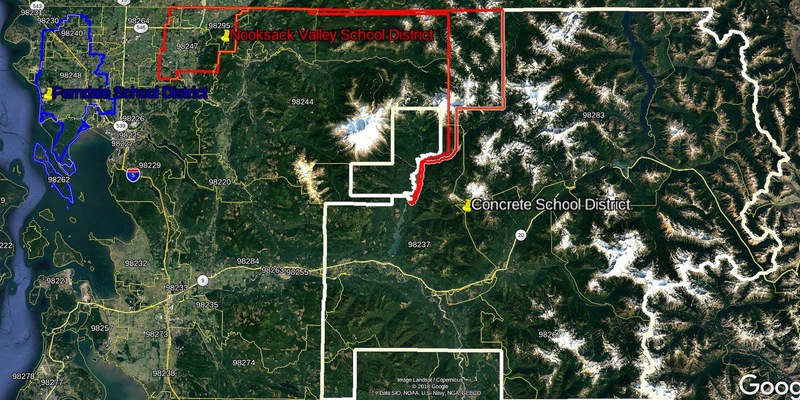 The Ferndale School District is outlined in white above . FSD has 24 full precincts and 4 partial precincts shown in shaded multi-color. FSD schools and other Whatcom County surrounding schools are labeled in white print. Click to enlarge the chart. "Deadline for in-person, mail-in & online registrations or address changes is January 14th"
"Ballots Mailed: January 23, 2019"
"This Special Election includes Ferndale School District 502, Nooksack Valley School District 506, and Concrete School District No. 11. " An historical Presidential Election Turnout chart. The data is from Willem M. van der Wal Elections (R) package. Plot functions for lines: blue = lowess(), red = smooth(), purple = smooth.spline(). Click to enlarge the chart. For Whatcom County and the state as a whole, age bins under 40 (with few exceptions) continue to chose to let late GenX, Boomers and Postwar generations decide political realities. However, Whatcom County shows much greater youth participation than WA State as a whole. Furthermore, migratory patterns of youth voters suggest that housing stability or "a stable residence address" my be a strong determinant in youth voting patterns. Whatcom County had 77% turnout of registered voters which was 5% points higher than the state average. Whatcom County also had higher turnout for Millennial and GenX age bins. Left axis is votes, bottom axis represents age bins, top and right axis represents turnout percentage per age bin as delineated by the blue line. For all of WA State, see charts below the break. Click to enlarge the charts. The hand recount is underway for the 42nd LD. "Final" certified results are here. A chart of the November 27th "final" (before recount) results is below as is a chart of all Whatcom County Results .Wide screen will be best for the second all county chart. Click to enlarge the charts. Click to enlarge. The all Democrat Erb vs. Richey Prosecutor's race defied red vs blue precinct patterns. Analysis currently under construction, but more charts below. Note that my data is precinct derived from 11/20/2018 and will need to be updated after certification. Also two precincts (269, 271) are 'protected' due to low participation for the Senate and County race, My totals don't reflect those precinct contributions. Requires wide screen. Click to enlarge the charts.